The Government has revealed plans to raise the cost of NHS dental treatments by five per cent. 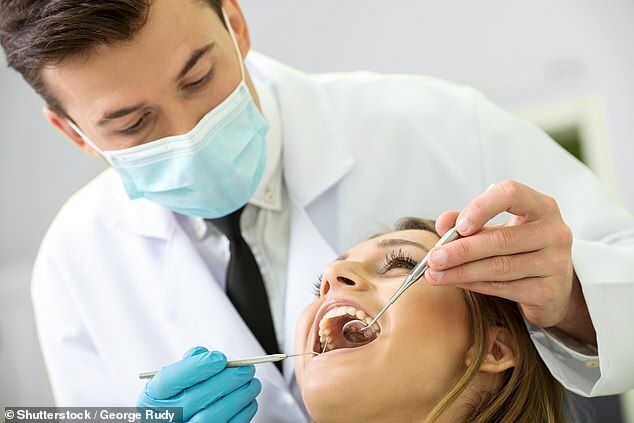 It means that a standard trip to the dentist for a routine examination and possible cleaning will cost £22.70 from April. Patients will have to fork out £62.10 for fillings, while crowns and other band three treatments will cost £269.30. However, critics today slammed the ‘appalling’ price hike and argued it will only discourage more people from seeing a dentist. Steve Brine, public health minister, made the announcement of the price increase for all three bands of NHS treatment. ‘Dental charges remain an important contribution to the overall cost of the NHS budget,’ he said. ‘We have taken the decision to uplift dental charges for those who can afford it, through a five per cent increase this year. Band one treatments, including examination and a clean, will rise by £1.10 in 2019-20, from £21.60 to £22.70. Band two treatments, including fillings and root canal, will jump by £3 in 2019-20, from £59.10 to £62.10. And band three treatments, such as that for crowns or for a set of dentures, will increase by £12.80 in 2019-20, from £256.50 to £269.30. Responding to the NHS price hike, Labour’s shadow health minister, Julie Cooper, said: ‘This is appalling news. Those who qualify for free dental treatment will remain entirely exempt from charges, the Government announced. Free treatment is given to those under the age of eighteen, pregnant women or new mothers, and those on qualifying low income benefits. But Ms Cooper said there are vulnerable people in society who will be hit the worst by the price increase. She said: ‘There is no doubt that a price hike like this will deter some people from accessing dental care, even when they desperately need it. ‘Tory Ministers are increasing these charges because they’ve lost control of the NHS’s budget. Charges have increased more than 30 per cent since 2010. The British Dental Association (BDA) has slammed the above-inflation rise, saying it will be a detriment to both patients and dentists. HOW MUCH WILL NHS DENTAL TREATMENT COST IN ENGLAND FROM APRIL? Henrik Overgaard-Nielsen, its chair of dental practice, said: ‘Despite pledges of record NHS investment, our patients are being singled out to pay more, just so ministers can pay less. ‘These inflation-busting hikes don’t put a penny of new investment into this service. ‘They will do nothing for patients unable to find an appointment, or the practices struggling to recruit staff. The association claims one in five patients have delayed treatment because it is already too costly. ‘Academic studies show 380,000 patients with toothache are choosing to head to their GPs, who are not subject to charges but are unequipped to provide dental treatment. The BDA added that charges for complex NHS treatment has increased four times faster in England than Wales over the past five years. Fees for treatments in bands two and three have gone up by 23 per cent since 2014/15 in England, and are expected to rise by only seven per cent in the same period in Wales. A lack of funding is putting pressure on dental practices and previous research indicates a staff shortage is imminent. The BDA have found that three out of five dental practitioners in England intend to reduce their NHS work, or stop entirely, in the next five years. NHS Digital data, analysed by the Faculty of Dental Surgery (FDS) at the Royal College of Surgeons, found that 57.7 per cent of under four-year-olds did not see the dentist in 2018. Overall, 41.4 per cent of children, up to the age of 17, did not attend an NHS dentist appointment last year. Some 32.7 per cent of five to nine-year-olds didn’t, and 27.6 per cent of ten to fourteen-year-olds didn’t. Parents are advised to make sure young children are seen as soon as their first teeth appear. Following that, health regulators say parents should schedule another check-up by the age of one, and then follow-ups at least every 12 months. If not, the risks associated could not only be damning for a child’s baby teeth, but have long-term consequences later in life, experts said.